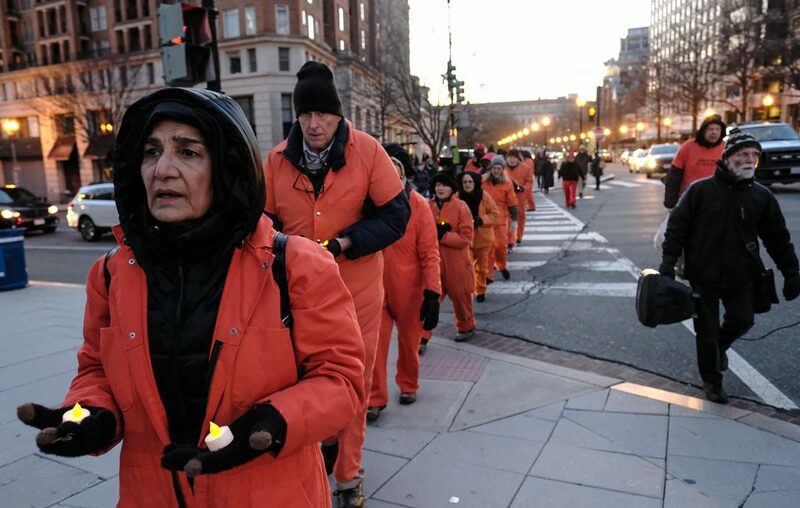 WASHINGTON, D.C. — Human rights activists, attorneys, ex-military investigators, faith leaders, and torture survivors rallied today at the White House to mark the 16th year of the operation of the US prison at Guantanamo Bay, Cuba, where “war on terror” detainees were first brought in 2002. 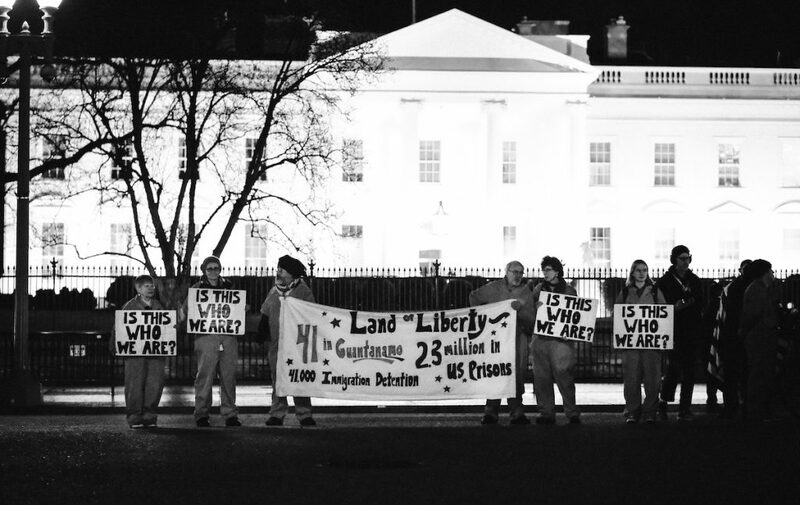 Five people — Beth Adams, Ken Jones, Manijeh Saba, Helen Schietinger, and Brian Terrell — were arrested at the White House, representing the five men still held at Guantanamo despite being cleared for release by the US government years ago. Thirty-six other men remain at the island prison, most of whom have never been charged with any crime. 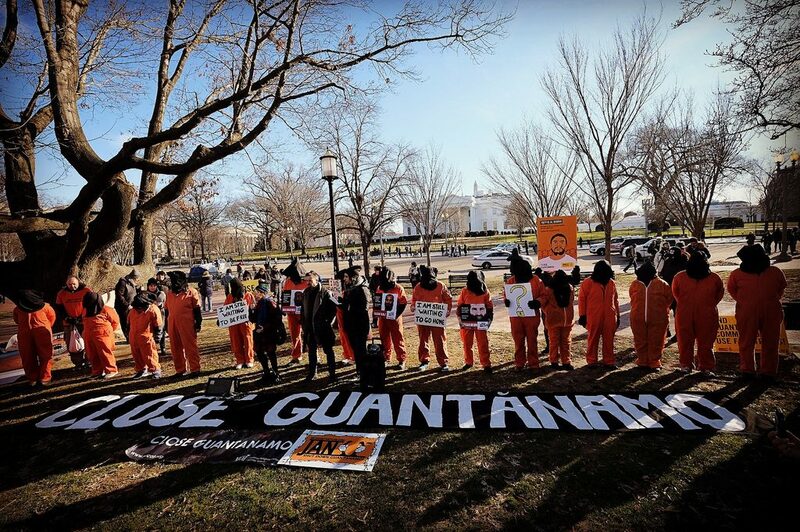 Earlier in the day the Center for Constitutional Rights filed in federal court a major new lawsuit — the first under the Trump administration — challenging the legality of arbitrary and indefinite detention at Guantanamo. 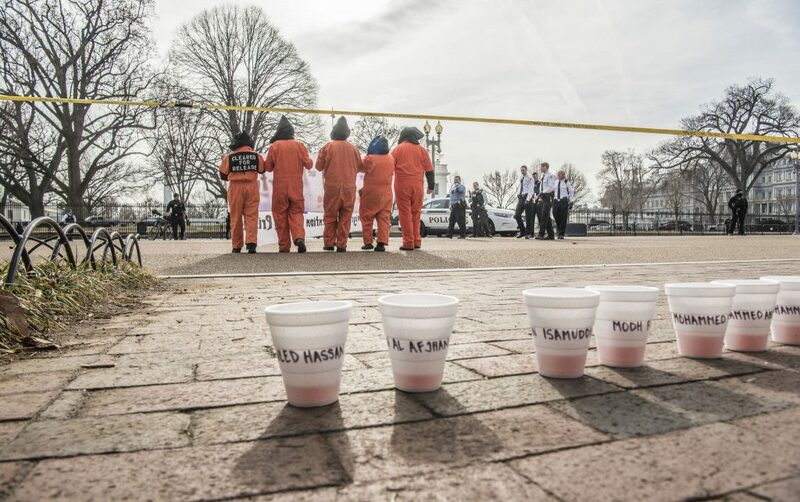 The rally speakers blasted the existence of Guantanamo as a terrible experiment in lawlessness and torture, driven by hateful suspicion of Muslims as agents of violence. 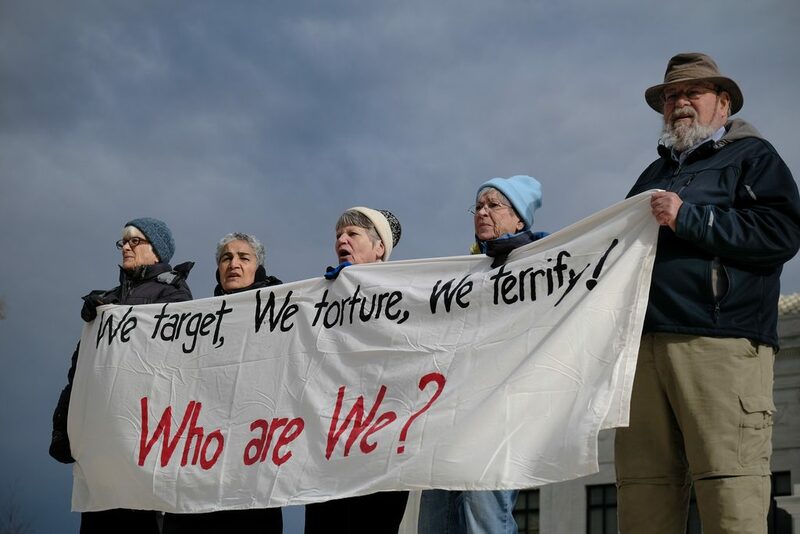 In tones mournful and angry, they called for the prison to close immediately and for those who designed and executed torture policies to be held to account. Sharp words for reserved for Donald Trump, who has threatened to bring new men to Guantanamo and to bring back torture methods such as waterboarding. 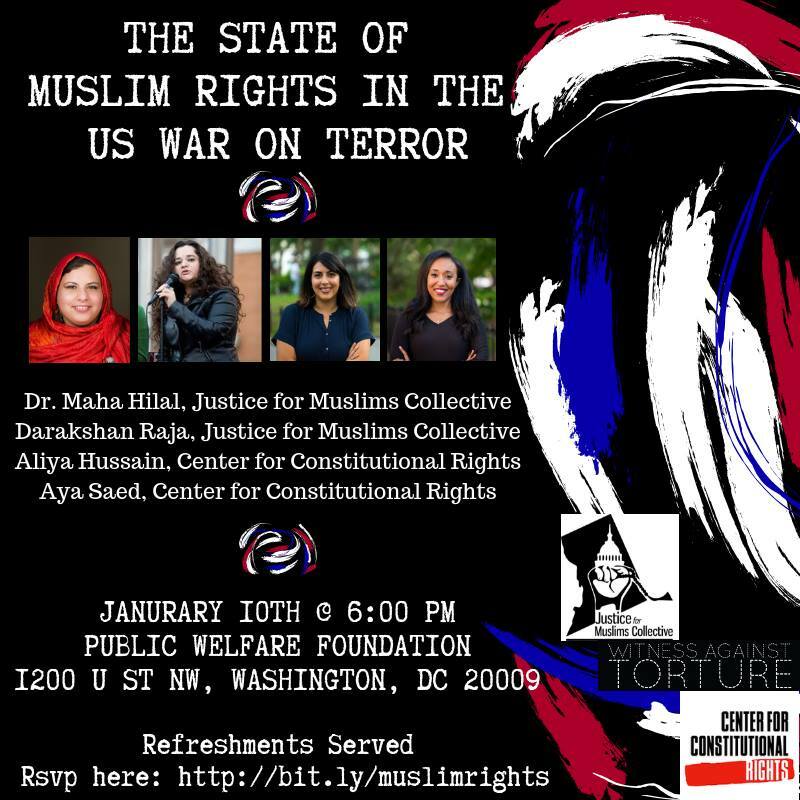 Maha Hilal of Muslims for Justice and Witness Against Torture spoke out against the growing climate of Islamophobia, which has deprived Muslims of basic rights, in Guantanamo and in the United States. 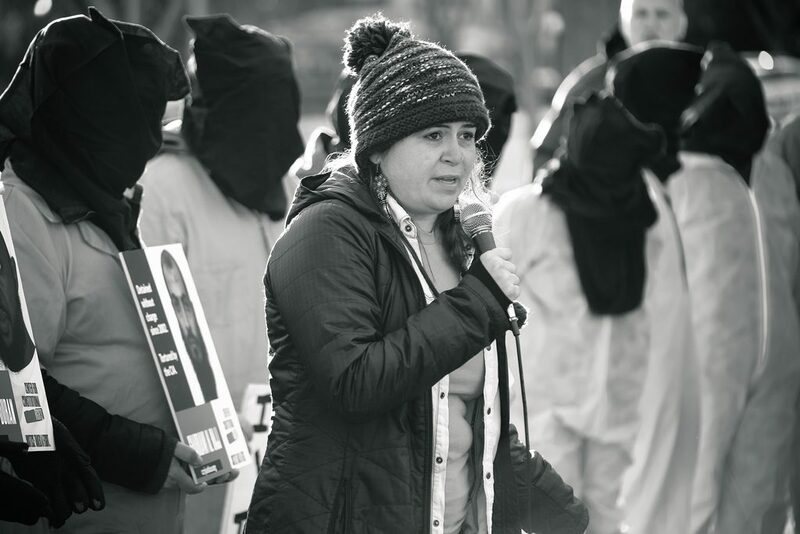 Attorney Shelby Sullivan-Bennis, who represents men currently held in Guantanamo, read a statement from one of her clients testifying to the importance of rallies like this in showing the world that the men at Guantanamo are not forgotten. Mark Fallon, the former lead Navy investigator first responsible for building cases against the 9-11 perpetrators, recited at the rally his military oath to uphold the US Constitution. Author of a new book detailing CIA torture, Fallon said that loyalty to the Constitution requires that he work to expose and end torture and to close Guantanamo. Terry Rockefeller from September 11 Families for Peaceful Tomorrows test inveighed against the Military Commissions as a sham system of justice that has mangled the rule of law in its failed bid to provide closure for the families of 9-11 victims. 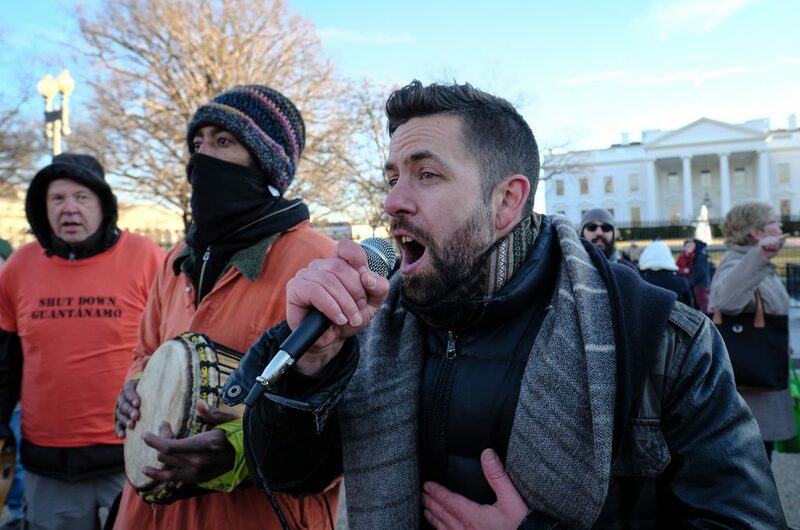 The five activists were arrested for breaching a police line outside the White House. 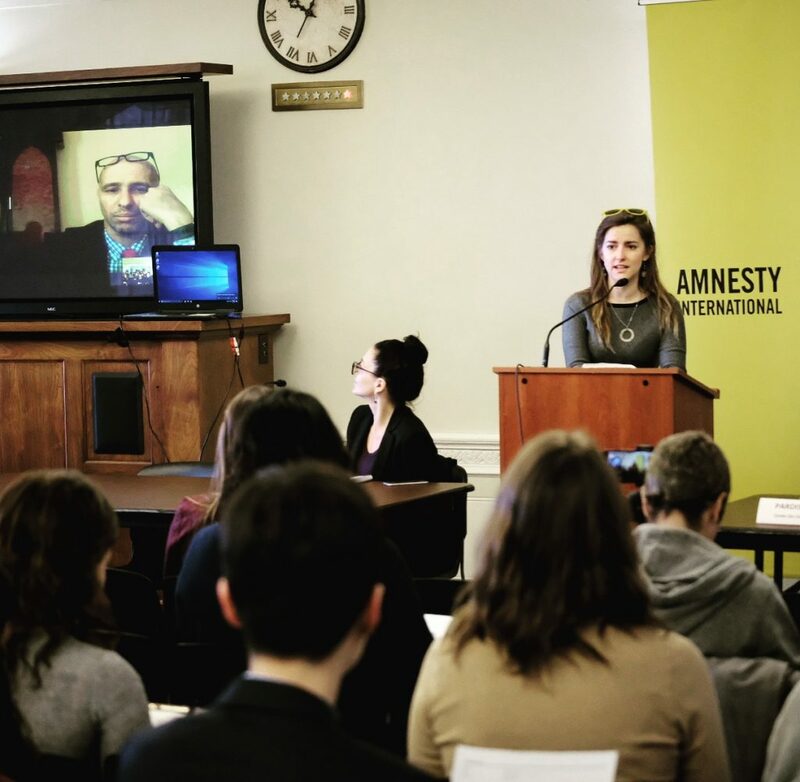 At the National Press Club that morning, attorneys from the Center for Constitutional Rights announced the filing of new litigation on behalf of eleven men held at Guantanamo. 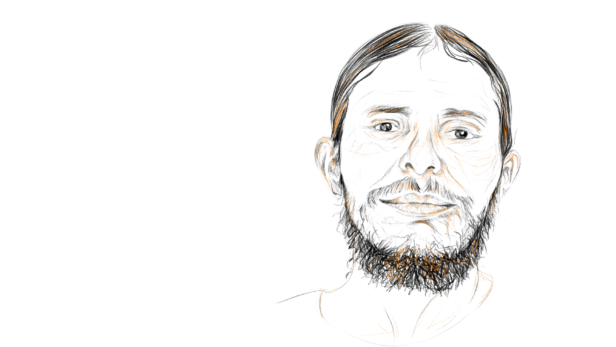 The lawsuit seeks relief from the courts, given the stated decision of the Trump administration not to release any men from Guantanamo, no matter the security determinations of the US government and the particulars of their cases. This policy, the lawsuit argues, makes the detentions at Guantanamo wholly arbitrary, based in President Trumps avowed hatred of Muslim and wish to deprive them of rights. 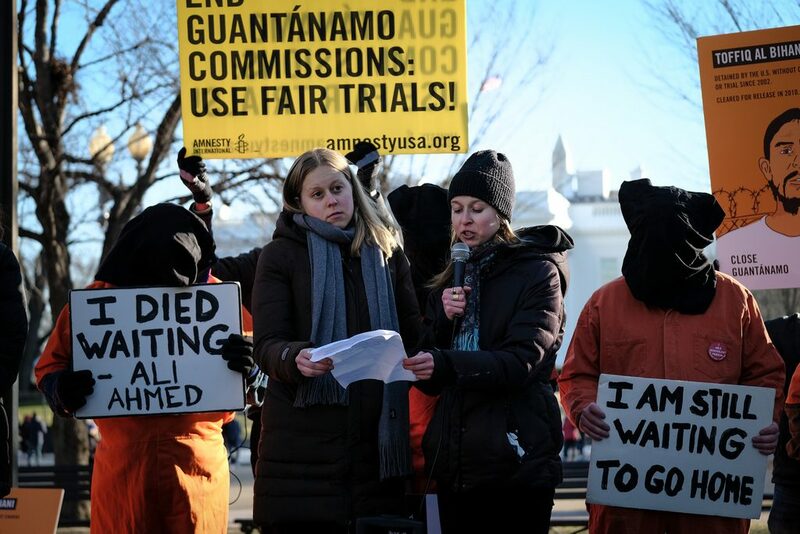 The lawsuit also mounts a new challenge to the legality of indefinite wartime detention, arguing that the hostilities following September 11 are now over, removing legal rationale for continued imprisonment at Guantanamo. The filing has already been reported on in major media, including The Washington Post and CNN. 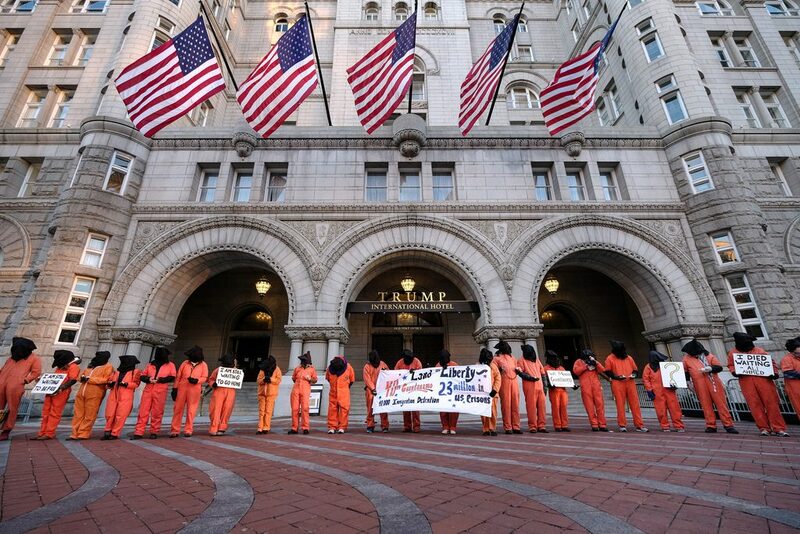 All those at the rally pledged to continue to do their work to close Guantanamo and end US torture. In the dark times shall there be singing? There will be singing about the dark times. We then processed, singing and carrying flowers, to the Senate Park where the largest immigration support rally occurred just a month ago. We remembered the long history of violence and oppression in the US and our hopes, from ending Islamophobia to ‘justice for the hills and rivers’. Even this week we hear in the news more stories of violence intensifying: the loss of protective status for Salvadoran refugees and, that very afternoon, immigration raids on dozens of convenience stores. 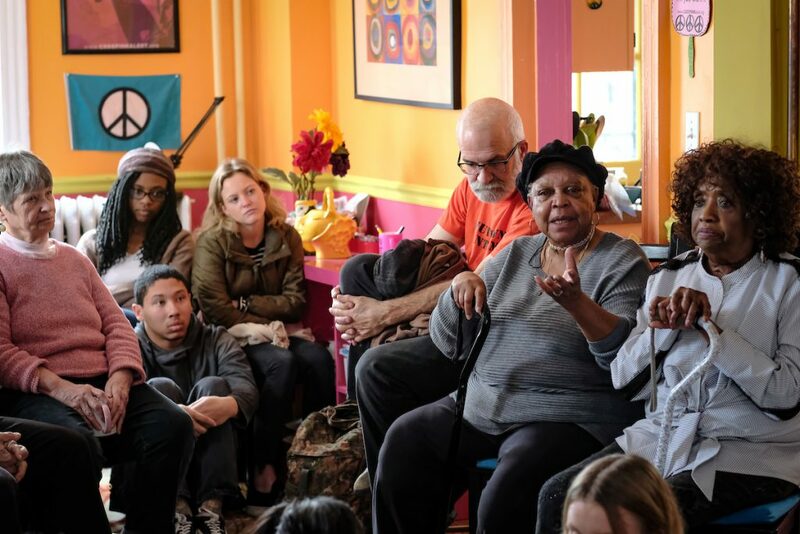 Wise leaders among us sense that grieving is fundamental to the emotional life of nonviolence, as John Dear tells us in a passage read for our ritual. We need to make grief a regular part of our daily meditation. Grief needs to become a way of life for us. For the millions of impoverished people in the world –from El Salvador to Chile to Malawi to South Africa to India and the Philippines–this is an old lesson. The indigenous peoples of the world have long practiced grief. 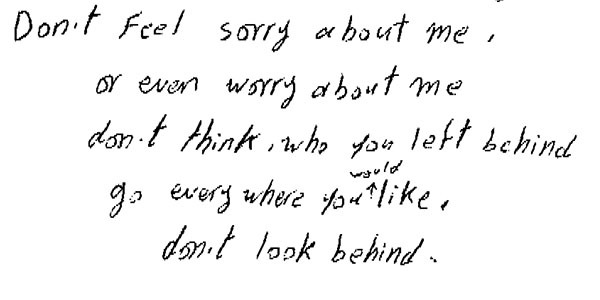 But wealthy first world people, especially North Americans, do not know how to grieve. We presume this is a morbid practice. In fact, it is a way toward healing and comfort, as those who care for the human family and the earth show us. The practice of grief allows the compassion within us to breathe and stretch, and the possibilities of universal love to grow within and among us. If we learn to grieve regularly, we will awaken to our common humanity, expand our hearts, widen our compassion, and discover new horizons of peace. For some the grief was personal, raw and recent. Afterwards, one member remarked that the ritual helped her fold her personal loss into the suffering outside our doors and borders. Our breaking hearts are strengthened for the work. We ended with a litany: We are grieving, we are sorry, let us hope. You may find the litany at the end of this message. Wednesday evening, at the Impact Hub down the street we held a book launch event. WAT’s new book, There is a Man Under That Hood, features Luke Nephew’s poem by the same name, accompanied by photos taken or curated by Justin Norman. The afterword is written by Omar Farah, staff attorney, Center for Constitutional Rights. Many of you will remember Luke’s spoken word performance of the title poem in front of the DOJ on a snowy, cold J11 in 2011. See it again at this link. WAT has been fearless in giving voice to the prisoners’ lived experiences. WAT has honored the prisoners’ humanity, even when the government cynically vilified them, and it has unflinchingly stood as witness to their suffering, even when the world’s attention turned away. Learn more and order a copy at this link. It’s early in the morning on January 11th, as we write this message. Can it be yet another J11 that we must come together? 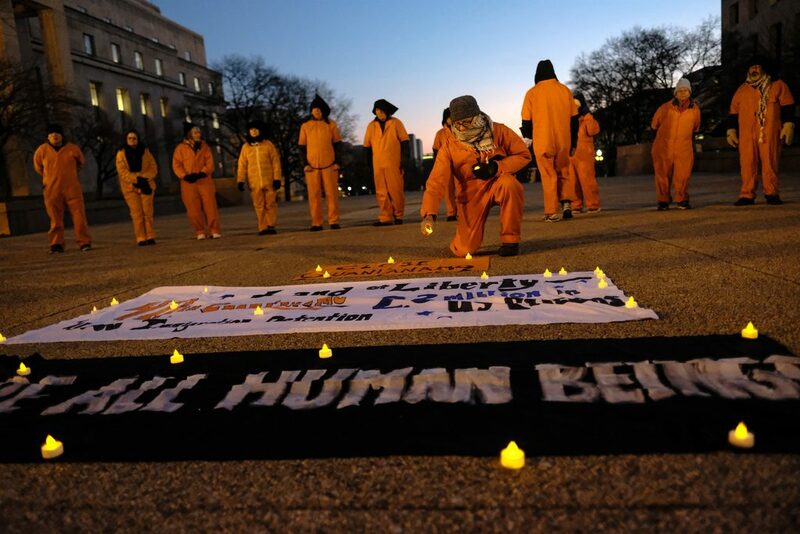 Today we mark 16 years since the first prisoners were brought to Guantanamo. We join with a coalition of 15 organizations to rally at the White House at 11:30 am. At 9:30 this morning, CCR will be livestreaming a morning press conference from the National Press Club in Washington, D.C., where they will announce a significant new filing challenging Guantánamo under Trump. 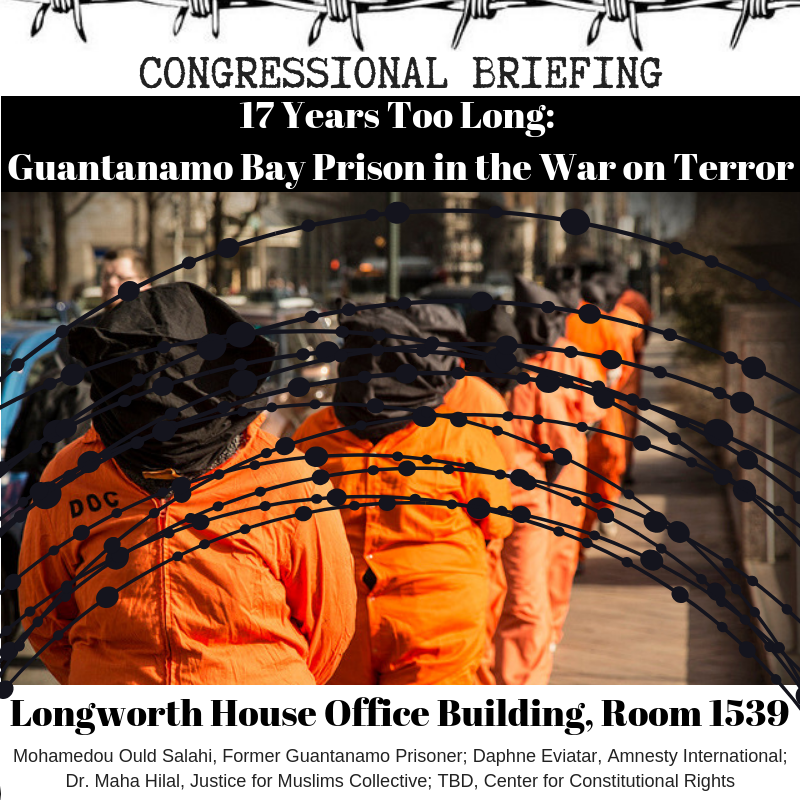 At 2:30 this afternoon, a panel entitled Guantanamo Under Trump, moderated by Peter Bergen, will take place at New America, 740 15th St., NW, Suite 900. Featured speakers will be Andy Worthington, Karen Greenberg, and Thomas Wilner. In closing, we offer you the litany we used in Wednesday’s grieving ritual. Together may we find strength for this journey. From the arrogance of power…. For our hardness of the heart….